Maryland Pink and Green: Mosaic & Originals winner! 5. Who is your celebrity crush? Well, it's not a celebrity per se, but I've been in love with "Jake Ryan" from Sixteen Candles for a LONG time! 12. Your Flickr name? I don't have one! So I searched preppy because I love all things preppy. Want to make your own mosaic? All you have to do is type your answer to each of the above questions into Flickr’s search. Using only the images that appear on the first page, choose your favorite and copy and paste each of the URL’s into the Mosaic Maker (3 columns, 4 rows). Have fun making your own! P.S. Congratulations to EntertainingMom for winning the small Lilly Pulitzer Originals tote! Please email me your mailing address at blbrodger1@hotmail.com. Thanks to everyone who participated!! Woo Hoo!!! Yipeeeee! I am so excited! I love that mosaic and as soon as I can I am going to make one. I will email you later today! Congrats Jessica! Love your mosaic... and Jake Ryan! Can't wait to make one for myself. Not much of a wine girl... can I make a Cosmo??? That would suit me nicely... Have a lovely day! 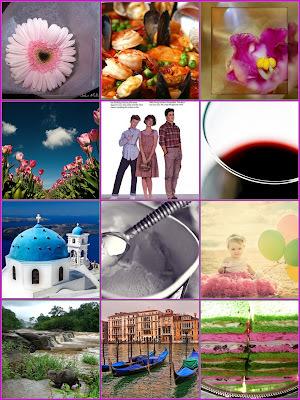 Love the mosaic, it looks like great software. Thanks for all of your great comments on my blog, its so nice to know that people are reading it! Congratulations EntertainingMom! I am going to have to check out the mosaic on flickr. Too cute! Oh, I love me some Jake Ryan!!! Bethany, Do your girls watch Hanna Montana, yet? Hanna has a crush on a reoccurring character and guess what his name is??? Jake Ryan! I have always wondered if that was a nod to our generation? Jake Ryan is such an icon, isn't he! @Wendy ~ I've seen that character on Hannah Montana and had to laugh when I heard it!